This week continues our annual review of the top prospects by position. Between now and Opening Day, we’ll examine one position a week by looking at both those rookies ready to contribute in the big leagues now, as well as the top 15 long-term prospects at each position. Again this year, our topic schedule will mirror the position covered in Market Pulse the same day, to give you a complete look at the position. Today, we take a look at the top 1B prospects. If you are looking for upper echelon fantasy bats, you’ve come to the wrong place. Only two 1B in the Top 15 ranking appeared on our HQ100 list. One of those guys, Rays two-way prospect Brendan McKay, likely appeared on the list more for his pitching prowess than his work in the batting box or in the field. McKay and Mets prospect Peter Alonso weren’t the only future 1B to appear on the HQ100. These other prospects don’t appear on the 1B list since they are currently listed at other positions, like Phillies prospect Alec Bohm on the 3B list last week and Astros prospect Yordan Alvarez on the OF list next week. Still, there is a solid group of 1B following Alonso and McKay on our 1B list. A BaseballHQ.com subscription unlocks articles like these all season long. Get the edge for 2019 in your league! Subscribe to BaseballHQ.com. This year’s list lacks immediate help at 1B, with Alonso and Rays prospect Nathaniel Lowe as the only guys who could make an impact outside a few September AB. There are a few prospects, such as Padres prospect Josh Naylor, Twins prospect Brent Rooker and Angels prospect Matt Thaiss, who are on the verge of the big leagues. Josh Naylor, who’s younger brother Bo appeared on our Top C list, is a thick, stocky 1B with some athleticism. He’s strong but power is limited due to the heavy top-spin his swing produces off the bat. His bat-to-ball skills are above-average and he continues to improve his patience at the plate. Brent Rooker is close to physical projection. His bat is a bit streaky and he’ll suffer from some ct% issues. However, he finds a lot of barrels during hot steaks and has 30 HR potential. Matt Thaiss has a natural feel for hitting. He continues to produce solid BA and ct%. At issue is his lack of power. Most evaluators feel he’s a 20 HR upside play, which isn’t practical at 1B long term. The dollar ranges listed below represent projected values for 2018. See a more detailed scouting report on each player by following the link to his team’s organization report or PlayerLink page. 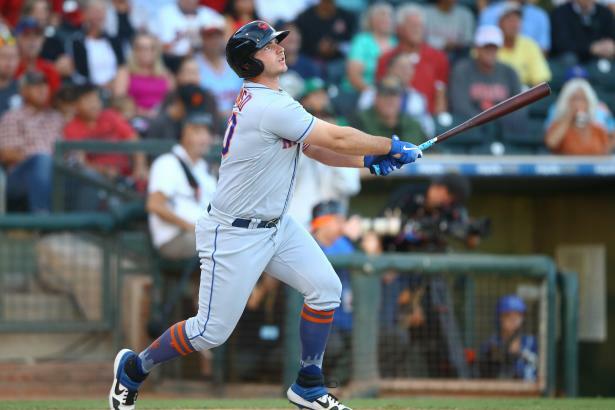 Shortly after being hired as the Mets General Manager this off-season, Brodie Van Wagenen announced he would like to see Peter Alonso at 1B for New York on Opening Day. With the acquisitions of Robinson Cano and Jed Lowrie, it doesn’t look like the Mets crowded infield will include Alonso anytime soon. Still, if any of the infielders go down, Alonso is the best option to get AB at 1B. Long term, scouts have compared Alonso to former White Sox slugger Paul Konerko. Alonso has a great approach at the plate and power to all fields. While some scouts worry the stiffness of his swing will hold down his BA, most believe the profile plays regardless. There is also concerns defensive limitations could eventually push Alonso to DH. God bless the fantasy analyst trying to figure out playing time potential for rookies in the Rays organization. It’s truly a guessing game how and when a guy could be called up, even if there seems to be a clear path to playing time and the guy is ready for the big leagues. Nathaniel Lowe is close to MLB-ready. He lacks the versatility the Rays love in their players. The big-bodied Lowe is hamstrung to a 1B/DH profile due to lacking athleticism. Once he debuts, his bat will keep him in the lineup. Lowe is a patient hitter with an all-fields approach. In fact, his power plays to all fields, which could push his HR totals over 30 in his prime. There is some concern his swing isn’t quick enough to sustain a high BA in the big leagues. However, expect plus power and high OBP to carry the fantasy profile. With Justin Smoak and Kendry Morales receiving most of the AB for the Jays at 1B & DH, it looks like Rowdy Tellez is on the peripheral of regular MLB playing time. However, with potential late-season moves, Tellez should see playing time during the second half of this season. He has always been an over-achiever. While scouts haven’t believed in him, the stats he has put up, even in a September MLB cup of coffee, have been encouraging. At Tellez’s best, he’s a second division 1B or DH with 25-plus HR potential and a .250 or higher average at maturity. The Rays announced last week two-way prospect Brendan McKay would no longer play the field, DHing on days he wasn’t the starting pitcher. We decided to keep him in this ranking anyway because we believe he could impact fantasy every day lineups, much like Angels two-way superstar Shohei Ohtani. McKay struggled in Single-A and High-A with the bat last year. Adjustments made to his swing, specifically to his swing trajectory, didn’t have the desired result of increasing his HR rate while also maintaining his line drive rate. The swing change caused his ct% and hard contact rate to plummet. Expect McKay to return to form as a hitter this season. His track record is too solid to fall apart again. Grant Lavigne destroyed pitching in his professional debut. One of the best power bats in last year’s draft, Lavigne made the jump from New Hampshire prep ball to the Pioneer League without missing a beat. He has a patient approach, walking more than he struck out in 206 professional AB, and showed an ability to work the opposite field, although all of his game power is currently geared towards the pull-side. Lavigne is far away from contributing. With the Rockies believing in a slow and steady ascent to the big leagues, Lavigne doesn’t debut before 2022. Seth Beer will probably never qualify as a 1B, given his struggles in the field. However, his bat has MLB regular written all over it, which makes him a future MLB DH. Beer’s bat is advanced and has blown through the lower minors already. He’s a big-bodied slugger with a selective eye and a solid approach. Some scouts have feared he’s more of a Three True Outcomes hitter. Thus far, his ct% hasn’t revealed that to be true. He’ll hit 25-plus HR with a .275 AVG and a superior OBP at maturity. Too bad there is no speed in Beer’s profile. The Mariners made substantial improvements to their farm system this off-season as they sold off some of their MLB parts to the highest bidders for prospects. While these moves improved the pitching in the system, the upper levels of the minor leagues lack hitting talent. The lone exception is Evan White. White is the rare RHH who throws from the left side. Being a RHH has hindered his ranking a bit, since historically only the best RHH 1B tend to have impacts at the position. Currently, White is a hit-over-power prospect. He has a patient, contact-oriented approach. There is above-average power potential in his frame, which has yet to show up as a pro. Still, the power projects to be in the 18-25 HR range, which isn’t coveted at 1B. The high BA potential and gold glove defense likely gives White opportunities to start at 1B. However, he’s projects to be more of an outside the Top 15 fantasy producer at the position.